SES Honorary Awards recognise and celebrate those individuals who have achieved great things, and whose passion, determination and grit are an inspiration to us all. Mark Beaumont cycled into Paris having circumnavigated the globe. He completed the epic Artemis World Cycle in 78 days, 14 hours and 40 minutes, breaking the world record by a staggering 44 days. It was through his vision, ambition, physical and psychological endurance abilities and the clockwork precision of his logistical planning, that he was able to complete this outstanding achievement. It is for the sheer enormity of the challenge, for making the impossible ‘possible’ and for the style and determination shown by him and his support team that SES was delighted to present Mark with SES Lifetime Achievement 2018. Emily Penn is an architect turned ocean advocate and skipper. After rounding the globe on a record-breaking bio-fuelled boat, she spent eight years at sea, exploring and discovering oceanic gyres – huge areas of plastic accumulation. Emily co-founded Pangaea Explorations, an organisation dedicated to marine education, conservation and exploration via a 72ft sailing vessel. Emily’s commitment to understand and inspire local and large-scale community involvement in tackling the issue of ocean plastic pollution is tireless, and it is for that reason that she was selected to receive the prestigious Hotung Award for Women's Exploration 2018 for her outstanding contribution to scientific exploration. Dual national Vanessa O’Brien became the first British-American woman to successfully conquer K2, the world’s second highest mountain, after a gruelling 16 hour summit push where she encountered deep snow, howling winds and temperatures down to -40 degrees centigrade. This was Vanessa’s third consecutive year attempting K2, and her team’s dedication and persistence paid-off as they became the only team to summit in 2017, following two years of no summits on K2. At the summit, Vanessa proudly displayed British, American and Pakistani flags – representing her homes and her host country – as well as that of UN Women. In recognition of her outstanding grit, determination and ultimately successful expedition, Vanessa was selected to be SES Explorer 2018. 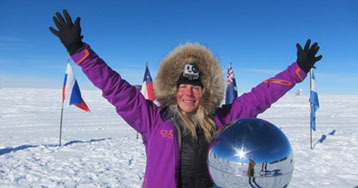 Rosie is a British explorer and polar adventurer who, since 1996, has embarked on major polar expeditions of increasing severity and commitment. The SES was thrilled to award her with the Hotung Award for Women's Exploration 2017.